After dominating in nearly every statistical category, the Los Angeles Lakers beat the Boston Celtics in game one of the 2010 NBA Finals thanks in part to a 30 point effort and a game-sealing three-pointer from Kobe Bryant. After an NBA record eight three-pointers from Ray Allen and a triple-double from Rajon Rondo that included ten fourth quarter points, the Celtics were able to even the series at 1-1 in game two. L.A. was off and running in the beginning of game three, but Boston was able to pull it close in the late stages. Derek Fisher scored 11 of his 16 points in the fourth quarter to help seal another win for the Lakers. The Celtics then took both games four and five to bring the series to 3-2 in their favor. Facing elimination, the Lakers traveled back to Los Angeles and held their opposition to a mere 67 points in a decisive 89-67 victory in game six. They were able to ride this victory through game seven and onto yet another championship ring. That’s a recap of what happened the last time that the Lakers and the Celtics met in the NBA Finals. Exciting, isn’t it? L.A. has been to the Finals a league-leading 31 times. In 12 of those appearances, it was matched up with Boston, the team that has made it into the Finals the second-most number of times (21). Regardless of the large difference in appearances, the Celtics have won 17 titles to the Lakers’ 16. That puts the total number of championships between these two at 33. Want to know a staggering statistic? Every other team in the league has combined to win 35 titles. 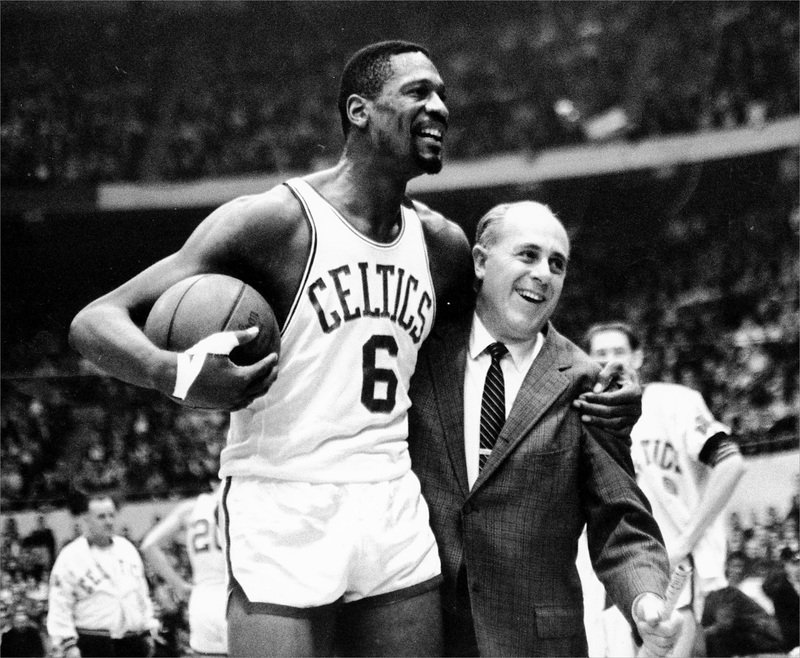 When you think of basketball history, some of the names that come to mind are Bill Russell, Magic Johnson, Kareem Abdul-Jabbar, Larry Bird, Elgin Baylor, Jerry West, John Havlicek, Wilt Chamberlain, and Bob Cousy among others. What do these names have in common? They all played for either the Lakers or the Celtics. Obviously, you also think of Michael Jordan, Scottie Pippen, the Chicago Bulls, and Space Jam. The Bulls won the NBA Title all six of the times that they went to the Finals. The teams that have the next-highest number of Finals appearances are the Philadalphia 76ers (9) and the New York Knicks (8). These two have decorated histories of their own, and the Lakers have met them in the Finals six and five times respectively. Madison Square Garden, the arena in which the Knicks play, is known as the Mecca of Basketball. So where are these teams now? The Bulls are going along at a fairly business-as-usual pace. Even with the in-and-out nature of this stage of the career of Derrick Rose, the team finds itself at 11-6 and atop the Central Division. The others? Well, to put it nicely, the 76ers are bad. To put it more accurately, they are awful. Historically awful. They are 0-17 and have spent more collective time in the fourth quarter at a 40-or-more-point deficit than winning. The Lakers, Celtics, and Knicks all have four wins apiece, bringing the combined record of these four highly decorated teams to 12-54. In the words of Tony Kornheiser, they stink. Still, though, they manage to garner an outrageous amount of attention from the media and fans due to their large-market associations and their history while there is much better basketball to be seen elsewhere. But where should we look, you ask? How about Toronto? The Toronto Raptors have been continuing to build on a 2013-2014 campaign that saw them grab the third seed in the Eastern Conference. Almost immediately after the season, the front office extended the contract of head coach Dwane Casey for three more years, and almost immediately after the start of the free agency period, it reached an agreement with point guard Kyle Lowry on a 4-year, $48 million contract. Toronto is no stranger to losing its big stars, so managing to keep Lowry during the prime stages of his career was huge for the team. Then came the resigning of both Patrick Patterson and Greivis Vasquez to keep production coming from off of the bench. John Salmons was shipped off to Atlanta for Lou Williams, Steve Novak was sent to Utah, and James Johnson was signed. Lowry is doing just what the front office hoped he would when they signed him to his new contract. 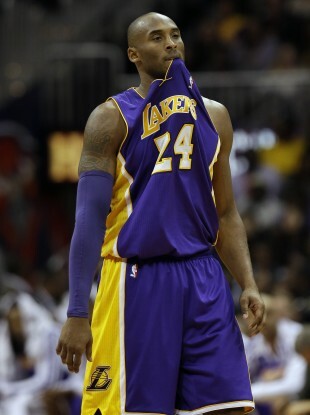 He’s averaging 19.2 ppg, 6.6 apg, 5.2 rbg. He has turned the ball over a mere 1.6 times a game, and he leads the way for a Toronto team that is ranked fourth in team turnovers. DeMar DeRozan has been off to his usual average of about 20 ppg. Young Lithuanian big man Jonas Valanciunas continues to improve across the board and provides a solid presence on the inside. The acquisition of Lou Williams has proved to be a good one, as he has managed 14.6 ppg in a mere average of 21.1 minutes each game. Swingman Terrence Ross showed us all a glimpse at his high ceiling last year when he dropped 51 points on the Clippers. He has been mired by a bit of inconsistency thus far this season, but that is to be expected from a player at his level of experience. Out to prove that it is a contender rather than a pretender, this relatively young team has exploded out of the gate. 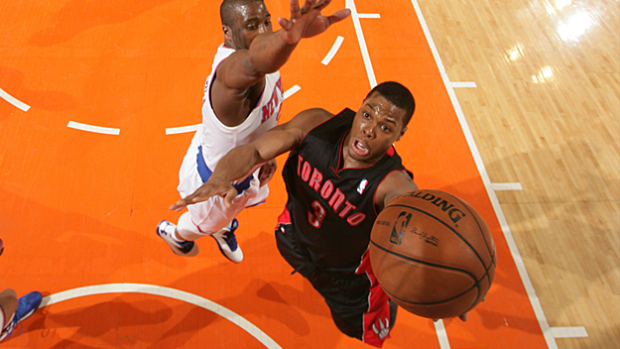 Now a month into the 2014-2015 season, the Toronto Raptors are the top team in the East at 13-4. In their first dose of primetime, they donned their best retro jerseys and humiliated the Washington Wizards on the coattails of Kyle Lowry’s triple-double (13 points, 11 rebounds, 10 assists). In a showdown with Memphis, they came out on top and are still one of just two teams that have managed to beat the league’s leading team. Things just seem to be clicking and they are playing some great basketball. The team ranks second in the league in offense and tenth in defense. 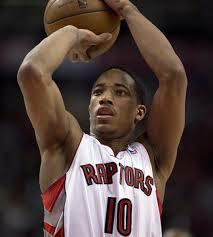 Unfortunately, it will be without the services of leading scorer DeMar DeRozan for the foreseeable future. He’s out with a torn adductor muscle, and the big question going forward will be whether the Raptors can manage to win games without him. So far, that prospect is not looking good, as they lost to the pitiful Lakers in an overtime battle in their first game without him. This is a deep team, however, and Dwane Casey is no joker. He’ll right the ship, and the Raptors will continue their solid play. Vasquez showed good chemistry with Lowry in guard sets throughout last season, so we will most likely see more of that develop with the absence of DeRozan. We’ll also likely see more of Terrence Ross. That will be fun. Still, this small-market franchise receives little media attention. Rest assured, this is bound to change throughout this season and in the coming years. The Raptors are trending upward and it’s going to be hard for them to avert our gaze much longer. It’s just a matter of time before this team that has yet to make it past the Conference Semifinals makes an extended playoff run. When you think about baseball history, you think about the New York Yankees. The Yankees have more World Series wins than any other team has World Series appearances. They failed to make the playoffs this past year for the second season in a row, a feat that has not been accomplished by the team since the 1993 and 1994 seasons. Now that the Derek Jeter retirement parade is over, the team has been gutted and looks like a last-place team. The Orioles took the AL East crown this past season, and the Yankees took second place. The Toronto Blue Jays were just one game behind them. They’re seeing their buddies over in the Air Canada Centre playing well and hoping that they can follow suit a few blocks away in the Rogers Centre. In the 2014 season, the Blue Jays were the hottest team in baseball from mid-May to mid-June and had Toronto fans going ballistic over their team’s best play in years. The dream season was in full effect, and everyone was feeling it. Then, of course, injuries to key players brought down the team’s record, dashed its hopes, and forced it to finish third in the AL East. 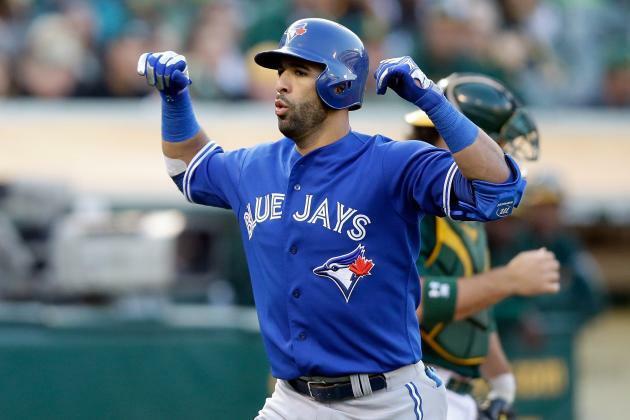 Still, outfield slugger Jose Bautista ended the season with 35 home runs and 103 RBIs and Edwin Encarnacion finished with 34 and 98. R.A. Dickey and Mark Buehrle are definitely not the pitchers that they used to be earlier in their careers, but they are still throwing some great games. Rookie Marcus Stroman looked rather promising at times and brought home an 11-6 record in 26 starts. He will be key for them going forward. The front office of the Blue Jays knows that with the impending decline of the Yankees, the high-risk offseason moves of the Red Sox, and the admitted rebuilding phase for the Rays, now is the time. It has already made a number of big moves. The first acquisition was as much a statement as it was a great signing. The Jays signed catcher and Toronto native Russell Martin to a five year, $82 million deal. Martin was a key cog in helping the Pittsburgh Pirates end the longest postseason drought in North American sports history. Toronto is bringing him home in hopes that he can do the same for its team that hasn’t been to the playoffs since 1993. In just 111 games last season, Martin batted .290/.402/.430 with 11 home runs and 67 RBIs and threw out a league-leading 37 base-stealers. In a similarly large deal, Toronto shipped the oft-injured third baseman Brett Lawrie along with three prospects to the Oakland A’s for third baseman Josh Donaldson. Donaldson finished in the top ten of the AL MVP voting at the end of both of his full seasons. In 2014, he turned in what was arguably one of the best seasons of any third basemen in the American League and his WAR of 2.7 was better than any other at his position. All of this AND he remains arbitration eligible for the next four years, so he very well could be a Blue Jay for quite some time. He will be a big upgrade for the Jays in his play and in the fact that he should actually be able to stay on the field. He has played in 362 of 372 career MLB games since being called up from the minors. During that span, Lawrie played 202, and now that he’s been traded, he is blaming the turf. While these moves don’t solve all of the problems for the Blue Jays, they definitely help the cause. Unfortunately, the increased spending is making it a bit difficult to see the team having the funds to be able to keep Melky Cabrera after another solid season at the dish. The team has also reportedly expressed interest in Alberto Callaspo to fill a potential hole that it has at second base. We’ll see what happens throughout the rest of the offseason, but it’s starting to look like Toronto is really trying to make a run. If its players can stay healthy, I could see that happening. I like the direction in which the Blue Jays are heading. Baltimore will still be very good next season and Boston is indeed shelling out lots of cash, but we’ve seen in the past that star-stacking doesn’t always work. The Knicks are bad, the Nets are below .500, the Yankees are bound for decline, the Mets are still the Mets, the Giants are no good, and don’t even get me started on the Jets. Yikes. New York doesn’t have much hope in the big three US sports. At least it still has the Islanders and the Rangers. The Lakers are bad, the Celtics are not good, and the Red Sox are doing everything that they can to prevent another last place finish. Dare I say that the times they are a-changin’? New York, L.A., and Boston have such big markets that they feasibly cannot stay out of contention for too too long, but for now, they are. 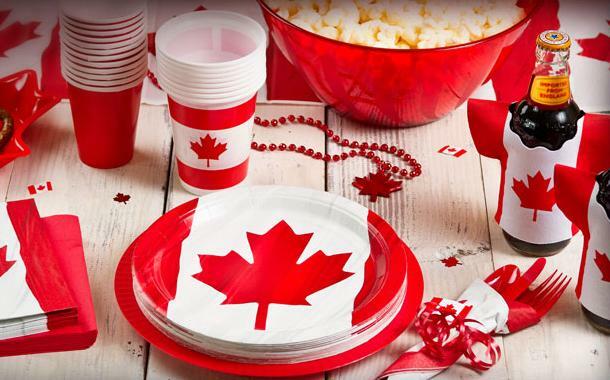 The Raptors are off to a hot start, and the Blue Jays are doing everything they can to join in on the Canada party and to prove that we should be paying more attention to our friends north of the border. You can expect to see me on that Toronto sports train. Should be some good games, eh? Someone pass the maple syrup! This entry was posted in General, MLB, NBA and tagged baseball, basketball, Boston Celtics, DeMar Derozan, Jose Bautista, Josh Donaldson, Kyle Lowry, Los Angeles Lakers, MLB, NBA, New York Knicks, Russell Martin, Terrence Ross, Toronto Blue Jays, Toronto Raptos. Bookmark the permalink. The Jays signed another Canadian! Thanks! I’m glad you enjoyed it. Feel free to check back anytime for any of my new content.